You love Cuban sandwiches. You love pizza. 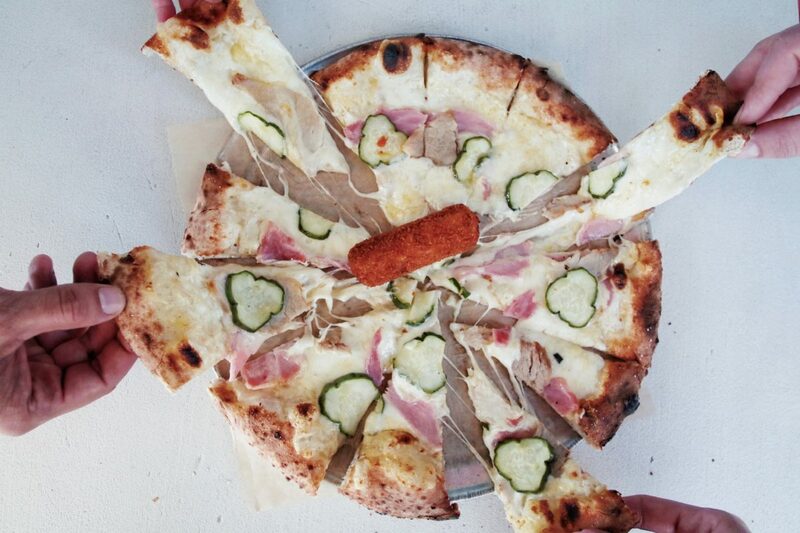 Now you can have your Cuban sandwich as a pizza. Versailles Cuban restaurant, paradigm of Cuban cuisine, partnered with honorary Miamian Michael Schwartz to create a pizza with the flavors of a Cuban sandwich. It will be available at all locations of Harry’s Pizzeria and Genuine Pizza starting Jan. 14. “We love to get creative with toppings combinations on our pizzas, and taking this one for a spin is a long time coming,” Schwartz was quoted in release. This so-called Cubano Pizza is not to be confused with Cuban pizza, a doughier cousin of traditional Italian pizza with a sweeter sauce that is particular to the island and South Florida. This pie takes the familiar ingredients in a Cuban sandwich and layers it onto Schwartz’s cold-fermented pizza. The source? Versailles’ own kitchen. Schwartz used the roasted pork and cured ham Versailles uses for its sandwiches. Add layers of mustard sauce, bread-and-butter pickles and a mix of fontina and gruyere cheeses and bake it in his pizzerias’ wood-fire ovens. The piece de resistance? A single, golden-brown croqueta at the center. Game over. “Our family is a huge admirer of Chef Schwartz and all he has done for the Miami food scene, and we are excited to have everyone taste this new spin on Miami’s iconic dish,” Versailles owner Nicole Valls, daughter of founder Felipe, said. The pizza costs $16 and will be available at Harry’s Pizzeria and Genuine Pizza restaurants in the Design District, Downtown Dadeland, Coconut Grove and Aventura Mall. Hours and addresses are available at genuinepizza.com/locations.